“By becoming a sponsor, donor or friend of AAF, you can make a difference in the education and development of future artists and assist them in achieving their dreams. The performing arts uplift everyone. Please join me in supporting the Art Attack Foundation”. "I was thrilled to be able to help raise funds for Art Attack. It is imperative for children to have a creative outlet by which they may celebrate the joys and steer through the storms of their young lives." Now, more than ever, young people with talent, need our help with training, support, encouragement and above all opportunity. That is exactly what the Art Attack Foundation provides, and why they need our help, in order to accomplish all they achieve. That very next scholarship that is given could be the one for a future star in the arts. I am proud and delighted to be a part of this fine organization. The Art Attack Foundation exists to inspire South Bay community leaders, businesses, foundations, and individuals to participate and contribute in the education, enhancement, and development of young performing artists. Art Attack Foundation nurtures and supports young talent through education, training, stage performances, scholarships, and other cultural activities. 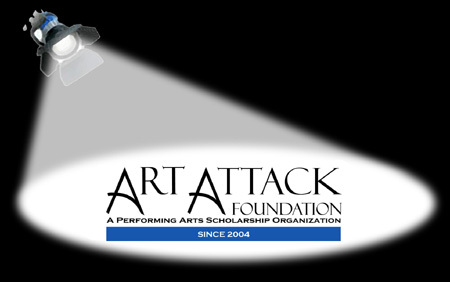 Together with community partners, Art Attack Foundation is dedicated to providing opportunities, encouragement, and funding to assist young performers in realizing their full artistic potential. Everytime you shop at Amazon.com we will recieve a donation. ART ATTACK FOUNDATION, that's it! It won't cost you anything extra. Thanks for your support!